As parents, we go to extreme measures to keep our kids safe. We apply sunscreen, buckle them into car seats, and make sure they’re wearing helmets when riding a bike or playing sports. But what if the biggest danger lies, not in the pool or the sun, but on our children’s plates? What if heart disease begins in childhood? Emerging research shows that by the time children enter elementary school, many already have risk factors for heart disease. According to one recent large-scale study, a staggering 40 percent of children ages six through 11 have elevated cholesterol levels. And more children than ever are now at risk for high blood pressure. The risks only multiply when it comes to the third of American children who are overweight or obese: Seventy percent of obese children have at least one precursor for heart disease. How can the signs of heart disease, typically considered an exclusively adult disease, manifest so young? It starts with what our kids are eating. According to new research, 99 percent of children eat unhealthy diets. For most of us, this doesn’t come as a surprise. From chicken nuggets on the lunch line to hot dogs at barbecues and ice cream cones after soccer games, junk food bombards impressionable youngsters everywhere they turn. As a result, most children consume an excess of artery-clogging saturated fat. And nearly all children –nine in every 10 – eat too much sodium. At the same time, most children’s diets are severely lacking in heart-healthy fruits, vegetables, and whole grains. Is it possible to help our children and turn the tide on this epidemic? As a doctor, I know that it is. The good news is that simple dietary changes are some of the most powerful and proven tools we have to combat many of these symptoms, including elevated cholesterol and high blood pressure. New research from the Cleveland Clinic shows that when obese children adopt a low-fat, plant-based diet, they lose weight and experience improvements in heart disease risk factors within weeks. Children in the study – along with their supportive families – purged their diets of animal products. Out came the meat, eggs, and cheese, and in went the fruits, vegetables, whole grains, and legumes. Immediately, their intake of fat, saturated fat, and dietary cholesterol plummeted, while their fiber intake increased significantly. Within a month, the children’s improvements were dramatic: lower weight, lower blood pressure, and lower total and LDL cholesterol levels. Plant-based diets have long been known to improve heart health in adults, but this is the first study to demonstrate the diet’s benefits on cardiovascular disease risk in children. Because children carry their early dietary patterns throughout their lives, the time is now to help our kids set the stage for a lifetime of good nutrition and health. A diet built on the healthy basics will help children maintain an optimal weight and lower the risk for certain chronic diseases later in life. 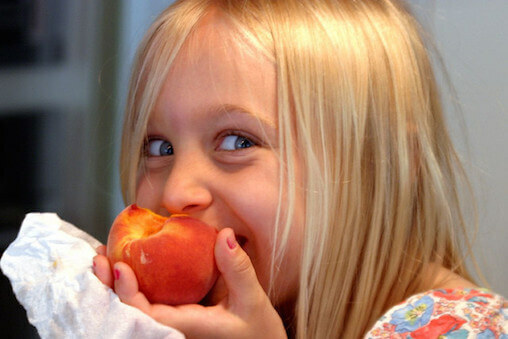 1) Fruit: Rich in colorful disease-fighting pigments, fruit is the sweet you can feel good about your kids eating. Brightening your children’s plates with five different colors a day will provide them with a wide range of protective nutrients that help support the cardiovascular system and overall health. Research shows that daily fruit intake can help reduce the risk of heart disease by up to 40 percent. Raisins, figs, bananas, and mangoes are rich in potassium, which can be even more powerful at lowering blood pressure in teens than reducing salt intake. Kid-Tested Tip: Will your kids believe you if you offer them heart-healthy ice cream? Blend a frozen banana with a bit of plant milk (soy, almond, rice, or oat) until smooth. Experiment by including berries or adding flavors, including cinnamon, nutmeg, vanilla extract, carob powder, or chocolate chips. 2) Vegetables: We all know that vegetables – filled with beta-carotene, potassium, fiber, calcium, and vitamins – are essential for maintaining health. But the average child consumes only about a serving a day. If your children turn their noses up at vegetables, try engaging them in the process of healthful eating by letting them choose two vegetables each week at the grocery store. One study also found that a little creativity can go a long way: Children whose veggies were labeled “x-ray vision carrots” actually doubled their daily carrot intake. So serve up some “dinosaur kale” and “broccoli trees” with an overall goal of four servings of vegetables per day. Kid-Tested Tip: Work new vegetables into your menu by presenting them in a form kids will recognize. For a healthful twist on french fries, cut sweet potatoes into wedges, season, and bake until crispy. To up the antioxidants in your pasta, try adding beets into pasta sauce. Steamed cauliflower can be mashed with garlic and spices to look just like mashed potatoes. 3) Whole Grains: Even though whole grains pack a bigger nutritional punch than refined grains, merely 3 percent of children meet the three daily recommended servings. If your children balk at making the switch to whole grains, try starting small: Bake muffins with whole-grain flour or gradually mix whole-wheat pasta into white pasta. Whole grains provide fiber, which can not only help lower cholesterol levels, but also keep your children feeling full – and often more focused – throughout the day. Kid-Tested Tips: Allow your children to assemble their own pizzas on whole-wheat pita bread. Skip the cheese – dairy products are the top source of artery-clogging saturated fat in kids’ diets – and load up on colorful veggies. Another way to get kids excited about healthful eating? Add some character to their plates! Assembling vegetables or fruits into the shape of a face can be a great way to top off a veggie pizza or bowl of oatmeal, and research shows that smiley faces can increase kids’ vegetable intake by 62 percent! 4) Legumes, Nuts, and Seeds: These foods are an excellent, cholesterol-free protein source. Incorporatingbeans into a healthful diet can result in lower LDL cholesterol levels, and consuming a small handful of nuts a day has even been linked to a longer lifespan. Find your child’s favorite source by experimenting with black beans, chickpeas, lentils, tofu, soy milk, peanut butter, pumpkin seeds, hummus, or veggie burgers. Kid-Tested Tips: Roast chickpeas in the oven at 400 degrees for 30 to 40 minutes or broil until crispy. Once they have finished baking, add salt, pepper, or other seasonings. The result is a crunchy, portable snack. For another on-the-go snack, create trail mix by combining your child’s favorite treats: Think nuts, sunflower seeds, raisins, and pretzels. 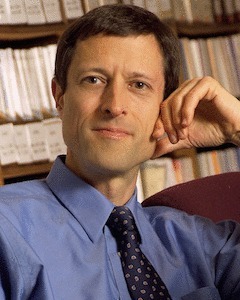 Dr. Barnard, is a well-known physician, researcher, and author. He is an adjunct associate professor at the George Washington University School of Medicine and Health Sciences, president of the Physicians Committee for Responsible Medicine, and host of the International Conference on Nutrition in Medicine: Cardiovascular Disease. For additional recipes and health tips from Dr. Barnard, visit www.KidsGetHealthy.org. 1) Fleming, RM. The Effect of High Protein Diets on Coronary Blood Flow. determines weight loss. Am J Med 2003;114:78.
concern! A case report. Angiology 2007; 58:102-5.
and Markers of Inflammation?” Angiology 2008;59:16-25. 8) Fleming RM, Fleming MR, Harrington GM, Ayoob KT, Grotto DW. coronary artery disease. Biomed J Sci & Tech Res 2018:10(5). ISSN:2574-1241. DOI: 10.26717/ BJSTR. 2018.10.002006. My presentations on 20/20, The Today Show and MSNBC have raised awareness into the factors associated with “Inflammation and Heart Disease” and “Angina.” UNFORTUNATELY, as discussed in the published papers, simply measuring weight change or changes in the common blood tests WILL NOT tell you what’s happening in the arteries of the heart or to cancer. To understand this requires the use of a “QUANTITATIVE” measure which is only possible with FMTVDM/BEST Imaging. I propose, that ALL DIETS be investigated to MEASURE their actual effect on Heart Disease and Cancer. This includes KETO diets and the KETO STALKERS, the VEGAN Diets and their advocates, AHA and everyone in between. It’s time to kick the log and see what crawls out! Thanks for your comment, Richard! I totally agree — objective data is the gold standard. In fact, I am personally involved in extensive health data collection. I’m part of the iPop study at Stanford. The study is looking at healthy people and trying to find a link between things like genetics, diet, exercise, infection and onset of new disease states. It’s very interesting, but there are only 100 of us and you must be local to be involved. I wish FMTVDM/BEST Imaging were cheaper. In the short run, if you know people or have patients with this data, you might consider using doc.ai to analyze the data and see “what crawls out”. Disclosure: I am a co-founder of doc.ai. I am involved because I believe in data-driven health decisions and empowering people to use their own data. I understand the statistics about children’s health. I question the cutting out of animal fat (meat, cheese, dairy, eggs). These foods, when eaten in moderation and cooked at home, as opposed to “fast food” can be included in a heart healthy diet. Actually if you look at the research, there is no amount of animal foods which are “healthy”. The question then becomes how much can be eaten before it starts causing disease. The answer to that appears to be 10% or less calories from animal foods in the diet. That is not 10% of the food eaten but 10% of calories. That is a really small amount for a child. At which point, Why even bother, given the health hazards of handling raw meat, the cancer risk associated with processed meats and the cancer causing chemicals created when meats are cooked. 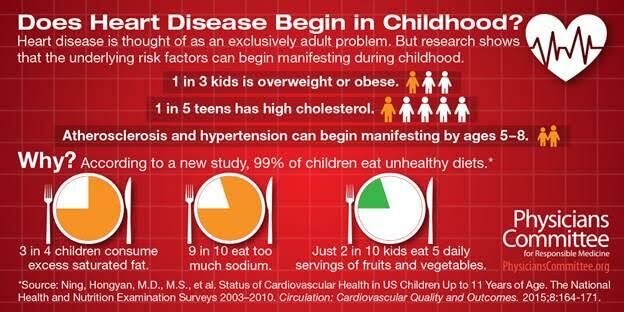 If your goal is to raise a healthy child why expose them to foods which can potentially cause them harm.